Pens Fatales: Don't Shoot! I'm in the Bathroom. 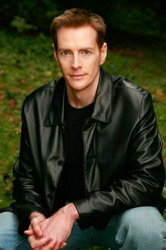 Welcome today's guest blogger, Boyd Morrison, whose debut thriller, THE ARK, was released in May. Boyd is a Seattle-based author, actor, engineer, and Jeopardy! champion. He started his career at Johnson Space Center, where he got the opportunity to fly on NASA’s Vomit Comet, the same plane used to train astronauts for zero gravity. He went on to earn a PhD from Virginia Tech, then used his training to develop eleven US patents at RCA and manage a video game testing group at Microsoft before becoming a full-time writer. When he’s not working on his novels, Boyd acts in stage plays and independent films. His hardcover debut thriller, THE ARK, was released in May, and translation rights for THE ARK have been sold in eighteen foreign markets. I have shot thousands of people in my life. Many of them were my friends. However, they don't hold it against me. In fact, they were expecting it. My extensive weapons training has prepared me for a career as a thriller writer. But I wasn't a cop, spy, soldier, or assassin (as far as you know). I got all of that experience playing video games. Before I became a full-time novelist, I worked in the Microsoft Xbox division as a user testing manager. We would bring consumers in to play the games we were developing to find out where players would get frustrated or stop having fun. And as part of my job, I had to play through the games so that I would know how to design the tests. Yes, I got paid to play games. Not that you have to pay me to play. I've been a fan of video games since my dad got me the first Pong home game. At the time, we were amazed at the sophistication of using two rectangles to bat a dot back and forth across the screen. It's been a long journey to the point where we are now, in which players are disappointed if the blood splatter isn't realistic enough when you blast someone in Grand Theft Auto. One of my favorite games is the Call of Duty series, which you can play online with other people. In the latest installment of this first-person shooter (as the genre is called), you take the role of a soldier fighting with the latest modern weaponry. The developers of Call of Duty have put thousands of hours into researching the dozens of real pistols, assault rifles, shotguns, and sniper rifles used in the game. The guns sound and operate exactly like they do in real life. You can even feel the difference in the recoil with the vibrating controller (FYI, if you enter the word “vibrating” into Google to get more information, “controller” is not the next word Google suggests). When I was with Microsoft and playing these games at home, it gave me a ready-made excuse when my wife would ask me to do chores. Now that I'm writing novels, my excuse is still intact. I view all of those hours in front of the television as valuable research. My debut thriller, The Ark, features a lot of gunfights. That happens when a madman is trying to destroy civilization and rebuild it in his own diabolical vision. Luckily, the hero, Tyler Locke, is a former army combat engineer with plenty of weapons training. He may not like being shot at, but at least he knows how to return fire. I, on the other hand, have never been in a real gunfight, nor would I really care to be, mainly because of the whole fear-of-death aspect. In my virtual Call of Duty gunfights, about the most dangerous thing I ever do is hurdle a chair on my way back from the bathroom so that I return in time for the start of the next game. I have shot real guns as research for my books. At the gun range I've emptied a few magazines into paper targets so I could accurately convey what it's like to fire a .22 caliber Smith and Wesson revolver (“plink”) and a .50 caliber Desert Eagle semiautomatic (“BOOM!”). But unless you're in a Stephen King novel, the paper targets don't shoot back, and there are only so many different types of guns you can try out in real life. I recommend video games to help you fill in the gaps. So if you're writing about a hit man and want to know how if feels to shoot someone with a Barrett .50 caliber sniper rifle from three hundred yards, try aiming at one of your friends. I can tell you from personal experience that headshots are the most rewarding. Vibrating underwear from the ugly truth?? Really? I had to go to Google and find out what the top suggestion was, and that's really dang funny. I shot that .50 caliber Desert Eagle once in a range years ago (you could take one shot for a buck -- they were no dummies). My shoulder still hurts. I used to play video games with my son, but I quit because I got so busy with the writing...thanks for the reminder that that was actually *work* time, so I can get back to it without guilt! Loving THE ARK by the way!! Yay, there's life after Software! Congrats on release of The Ark!!!! !